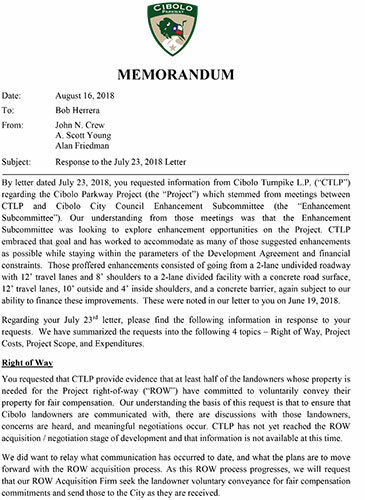 By letter dated July 23, 2018, you requested information from Cibolo Turnpike L.P. (“CTLP”) regarding the Cibolo Parkway Project (the “Project”) which stemmed from meetings between CTLP and Cibolo City Council Enhancement Subcommittee (the “Enhancement Subcommittee”). Our understanding from those meetings was that the Enhancement Subcommittee was looking to explore enhancement opportunities on the Project. 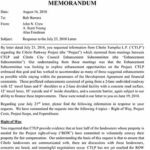 CTLP embraced that goal and has worked to accommodate as many of those suggested enhancements as possible while staying within the parameters of the Development Agreement and financial constraints. Click here to read the entire document and appendices. 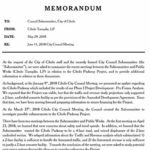 At the request of the City of Cibolo staff and the recently formed City Council Subcommittee (the “Subcommittee”), we were asked to summarize the recent meetings between the Subcommittee and Public Werks (Cibolo Turnpike, LP) in relation to the Cibolo Parkway Project, and to provide additional information in relation to those discussions. Click here to read the entire document.